Camp Fire Girls utility knife in near mint condition by Kutmaster made in USA carbon steel. Camp Fire Girls Utility knife in near mint or better condition by Kutmaster. All made in USA. All are carbon steel. Camp Fire Girls utility knife in near mint condition by Kutmaster Utica, NY. Made in USA. Four blade with composite handles. It is 3-3/8" closed. It has never been sharpened or used. It does have very light tarnish on the blades. Nickel silver bolsters. Carbon steel pocket knife that walks and talks great. 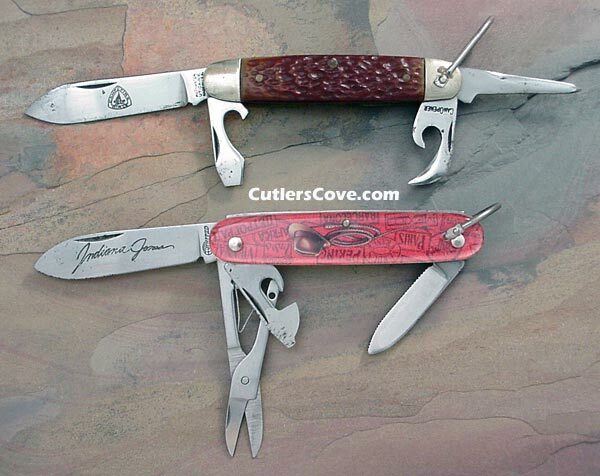 Spear, leather punch, bottle opener with screw driver and can opener blades. Because the blade is etched with the Camp Fire Girls logo I think this knife was made before 1975. One to sell. Camp Fire was founded in 1910 by Luther Gulick, M.D., and his wife, Charlotte Gulick, as the first nonsectarian organization for girls in the United States. In 1975, membership was expanded to include boys. Headquartered in Kansas City, Mo., Camp Fire USA currently serves nearly 750,000 children and youth annually. Young Indiana Jones Chronicles Adventure poster showing the knife. How to sell to us: Click here.